Anne and Venom discuss the etiquette of PDA while an oblivious Eddie snores on peacefully. Poll: Do we want promo posts on Symbrock? We've had a couple of posts promoting other communities recently. Technically they don't fill the charter for symbrock as they are not fanworks about Eddie and/or Venom, even if they are open to Venom related fan works. So, do you want them? Are they useful content to you, or should I be using my Moderation button and deleting them? Poll #21720 Do you want promo posts for other communities? Should promo posts for other communities be allowed in Symbrock? 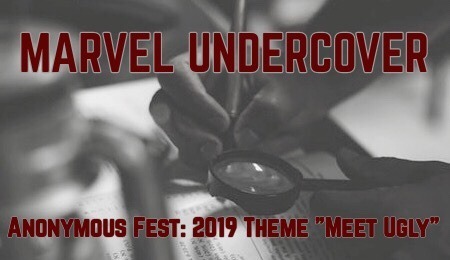 marvelundercover is a prompt based anonymous fest for works inside the Marvel universe. We are currently collecting prompts based on this year’s theme (Meet Ugly). Participants will then choose a prompt and create art or fic based on that prompt. Submissions will be posted anonymously on AO3 until final reveals at the end of the fest. You don't have to commit to creating anything in order to submit prompts, and vice versa. All Marvel media universes & crossovers are welcome, including and and all Venom 'verses! All pairings & gen, all ratings. Check out the Rules & FAQ, along with details on how to submit your prompts, here! This post is the place to post anything to do with new beginnings and Symbrock, including prompts, brainstorming, comment fic or art, and so forth. You can interpret "new beginnings" in any way you like, from Easter to goo!preg and anything else you desire. April Challenge -- New Beginnings! I know it's been a bit quiet around here lately. It's hit that time of the semester where it's all marking all the time. It's a bit frustrating as I have many languishing WIPs, including one for the March Fractured Fairy Tale Challenge, but that's how it is sometimes. I'm sure you all know what that's like too. Anyway, it's time for a new challenge. Our theme for the first half of April is New Beginnings. This can include things like Easter, kid!fic, goo!preg, or things like a hot new scoop/job/romance. As long it's related to a new beginning for Eddie and/or Venom in some way, anything goes. I'm going to post a separate thread in a moment for brainstorming, as usual, but this time I'm also going to open it up to comment fic, or short poetry, rough sketches and so forth. Anything you can fit in a comment is fair game. Hopefully that means that even with life being a bit full-on at the moment, we can share a few snippets and have some fun that way. In the second half of April, we're going to have an Amnesty, in which any works made and not finished for any of our challenges so far can be licked into shape and posted. This seems like a low-key event, and I'd love to see more familiar fandoms in the prompts. What kind of poetry does a journalist write? What kind of poetry does an alien write? I'd be curious to know. Thanks to everyone who took part in the Poll about what our March challenge should be. Fairy Tales clearly won, but there were also quite a few people who chose "All of the Above." So we'll do Fairy Tales for March, and some other kind of general remix challenge later in the year. Pick any fairy tale of your choice -- see below for inspiration -- or make one up. If you think it's a fairy tale, it counts as one for the purposes of this challenge. You can also remix more than one fairy tale in the same fanwork if you wish, in the style of Shrek. Once you've picked a fairy tale/s, remix in some way to make it about Eddie and/or Venom. Any kind of fanwork is welcome -- art, vids, fiction, playlist, meta, etc. Post your fractured fairy tale any time in March and share it here on the symbrock community. The person who posts the most fractured fairy tales in March can choose our next challenge, if they so wish, with the proviso that I might tweak it a little to fit better into our community's ethos. These resources are not definitive -- you can choose a fairy tale not included in any of these archives, or make up your own. This is just a place to start if you're looking for ideas. Please add links in comments if you have suggestions for more resources. Have fun fracturing your fairy tales! Note: Chapter 2 of this story is Explicit, but Chapter 1 is rated for Teen Audiences and Up, and can be read stand-alone as a friendship romance. Summary: Venom doesn't understand human emotions. And then they get a clue. There's also a meta post which goes with this story: Aesthetics and Venom. I was just looking at my wip file, and realised I never crossposted this series here, as I wrote most of them before the community was created. These stories stand alone, although they do chronologically and thematically follow each other. I have two more planned to finish off this particular 'verse. Venom learns to want; Venom learns to ask. It's still Valentine's, uh, month! So here are some icons representing what love is truly like: schmoopy, slightly terrifying, gooier than expected. Summary:Venom asks Dan to help throw a surprise birthday party for Eddie. Written for the Chocolate Box gift exchange; thanks to my betas luckyraeve and cesperanza ! I've been thinking about what kind of event to run here in symbrock during March, and have decided that we're going to do a remix challenge. That is, we shall create Symbrock fanworks that are fusions/crossovers/inspired by the tropes of a well known genre. But then I couldn't pick a genre. I do love fannish reworkings of romcoms and fairy tales, but there's so much more -- Harlequins? Detective novels? Musicals? I mean, can't you just see Murder On the Orient Express subverted by head-chomping aliens? Or Harlequins, oh god, Harlequins! Can you imagine Eddie as a war bride for the conquering Klyntar prince Venom? The conquering Danes have taken everything from Elswyth - even her mother. So, despite the uneasy truce between their people, she knows where her loyalties lie. Until she meets towering Rolfe, leader of the opposing forces. Her mind knows this muscled Viking is her enemy. So why is her traitorous body so tempted by his suggestion that she become his wife? It almost writes itself, am I right? Anyway, I was torn, so maybe you should pick. Time for a poll! Poll #21417 Which genre shall we Symbrock in March? What the hell, all of the above! Tell me what you think we should remix, and I shall dutifully put together a set of links to summaries of works in that genre as inspiration. In the rules for the fest, I said that people taking part had to wait 2 weeks before crossposting their works anywhere else. I'm not sure why I made it two weeks. I'm thinking that one week is enough. So, if you took part in Venomtime's Day, you are now free to post your work anywhere else you like. I also want to say to those viewing the fest -- thank you for all your comments and kudos. It's made the fest a lot of fun. If you haven't yet checked it out, please do, and leave a comment or kudos if you're that way inclined. Sorry for the late notice on this, as I didn't think to make a post here before now. There's a space_swap exchange that's relevant to our Venom interests, and it's closing for sign-ups in 8 hours. Venom is one of the fandoms you can offer or request, for fanfiction, fan art, fan vids, and podfics. However, there's currently a problem with not enough character tags available in the Venom fandom to enable sign-up -- I've pinged the mod and it should be resolved soon. So if you want to sign up with Venom as one of your fandoms, you should be able to. I'll edit this post once it's resolved. Great work, everyone. We may be small but we are feisty. I'm impressed with the range we've managed, as there's not only several stories, but art, a vid, and a playlist. Where to start?? What a great dilemma to have! I'll be opening up the Venomtime's Day gifts in about two hours. If you didn't make the deadline but have a little something you want to share, now is the time to post it. It's time to get your gifts submitted for Venomtime's Day. The deadline to submit a fest entry is midnight 13 February GMT. You can find the AO3 collection here, and the inspirational prompt post here, and the rules are here. If you'd like to celebrate Symbrock on Valentine's Day, the deadline to submit a fest entry is midnight 13 February GMT. Any kind of fanwork is welcome (fic, meta, playlist, art, vids, rec set, etc), as long as it focuses on Venom and/or Eddie from the movie or comics. cupidsbow - Poll: Do we want promo posts on Symbrock? cupidsbow - April Challenge -- New Beginnings! gold_pen_leaps - Look! A poetry fest! cupidsbow - Happy Venomtime's Day!! !